Where are the best WNY bridal shops for your wedding gown, bridesmaids gowns,and wedding accessories for your wedding? 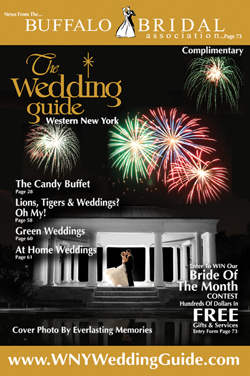 Check out our suggested bridal shops in WNY. What girl does not love to peruse the wedding gowns, bridesmaids gowns and other wedding accessories that bridal shops carry in stock? If you are planning your wedding and you have yet to select the bridal shop that you want to purchase dresses from, you will definitely want to check out our recommendations above. You will find that their professionalism and the way that they treat you and your bridal attendants will make you all feel like queens. The shopping in bridal shops does not stop at the dresses and accessories for weddings. Many bridal shops carry and display prom dresses, gifts, unity candles, decorations, and don’t forget the tuxedo for the groom-to-be! Bridal shops are the places where some of the biggest wedding decisions are made; this is where the “dream come true” starts to really form in the minds of the bride-to-be and the groom-to-be. The bride-to-be can spend time trying on gowns that are adorned with satin, lace, and beads in fashions that are fit for royalty. During your wedding planning, you will want to visit a few bridal shops to see what each one has to offer and the feeling that you get when you walk in the door. How are you greeted? Is the atmosphere modern and chic or old fashioned and classic? Are the ladies in the bridal shop attentative and friendly or stuffy and standoffish? You will definitely know how you feel about each of the bridal shops that you visit within moments of walking in the door. It is important for you to know that your experience at the bridal shop of your choice will be different than your friends’ experiences and your family members’ experiences, because your needs and wants are different than their wants and needs. Your bridal shop experience should be exciting and fun and you should be catered to like you are the queen of the day. Our listing of WNY bridal shops understand this, and will ensure that you are provided with a once-in-a-lifetime wonderful experience that you will never forget. Once you have chosen the bridal shop that you feel the best vibes in, you will be introduced to your bridal consultant. Your bridal consultant will be there for you, every step of the way and for every decision that you make in the bridal shop. Of course, the biggest choice is going to be which gown that you, the bride, will wear for your wedding gown. Your eyes may fall upon the dress of your dreams or you may have to try on a hundred gowns before you make the ultimate decision. You are going to want to sit down and tell your bridal consultant the aspects and qualities that you want in a wedding gown. Your bridal consultant will bring the gowns to you and help you fit into them, one at a time. Once you have chosen the wedding gown of your dreams, your bridal consultant will also assist in chosing the best bridesmaid gowns for your wedding, as well. You may already have a theme in mind, and the colors of the bridesmaid dresses can correspond with the theme. Or, the bridesmaids may have offered their advice on colors for gowns. Either way, your consultant will pull together your thoughts and recommendations and show you different options to choose from.